Posted By Nathan On June 22nd 2015. Under Blog Tags: beautiful resume, resume reading . Some resumes are really unusual. 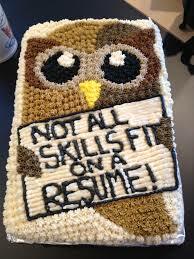 Imagine a resume made as a candy bar, or a resume cake. How about a sewn – Yes, really, sewn – resume? Sound a bit drastic for your tastes? Well, the guy who made a candy bar out of his resume got the job. There’s a problem with the “wacky” resumes – they only work where the employer is receptive to novelty and fun. That, however, isn’t the real story of the unusual resumes. The real story is surprisingly subtle, and very interesting. The real standout resume in any group of resumes is the expert professional resume writing. This is the resume that shows skills the other resumes can’t deliver. It’s the “smartest resume in the room”if you like. If you’re a real professional, consider what other professionals in your field would appreciate in a job application. Professionals need other professionals at their own level. So you can show some work in your resume that another pro will definitely recognize and understand its value, for example. What in your work or achievements distinguishes you as a superior candidate? Find examples in your skills and show what you can do. You can put together a beautiful resume which will make a good, highly effective impact when someone’s reading your resume. 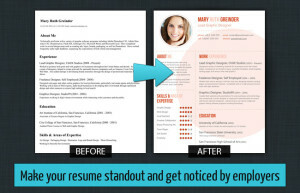 Standout resumes don’t just “stand out”. They attract real interest, instantly. The person with the standout resume is considered a genuinely useful person on the basis of the resume alone. Some people get interviews on a regular basis simply because their resumes are truly unique. The pattern is that like any good marketing exercise, the orange among the apples really stands out and is instantly noticed. That’s not the end of the success story, though. There’s more to it, and it’s a scary but intriguing look at successful resumes in general. The people that put together these standout resumes tend to be real standout individuals. They not only get the interviews, they get the jobs. They really are that good at their work. The true standout resumes are category killers. They’re resumes by experts in their fields. Whether the resume writing in the form of a candy bar, a tea towel, or a nice cake, it delivers what the employers want to see. In fact, they can’t wait to see it. These resumes aren’t gimmicks. They’re professional career moves. If you’d like to see the candy bar resume and get some more information about the strange but very successful standout resumes, see this link. Images are teaken from: gstatic.com, designyoutrust.com.